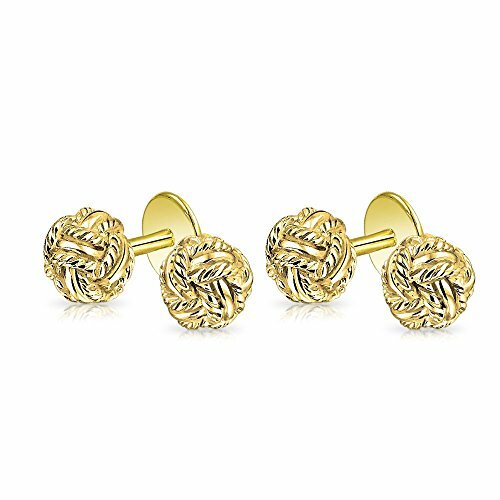 Our remarkable double love knot shirt studs are a sensational way to show him that you love him. They are made entirely of .925 sterling silver and dipped in Gold Plated for an elegant look. Add the perfect finishing touch to your well dressed mans look and give him a pair of gold plated cufflinks that he can wear with his favorite French cuff dress shirt. Love knot studs are a great gift idea for grooms and groomsmen to look their best on such an important day. For the dashing, well dressed dad, a pair of sterling silver cufflinks makes a wonderful and thoughtful gift of Fathers Day jewelry or of Valentines Day jewelry. Order yours today.